That the supermarkets did not breach the law is not a surprise. British consumer protection law in the form of the “Consumer Protection from Unfair Trading Regulations” is a charter for rip-offs. The law explicitly states that deception is perfectly legal so long as it only deceives the less than average consumer. Incredibly it is also explicitly legal under this law for a trader to knowingly engage “in a commercial practice which contravenes the requirements of professional diligence” so long as his actions are not “likely to materially distort the economic behaviour of the average consumer with regard to the product under regulation”. Blimey! 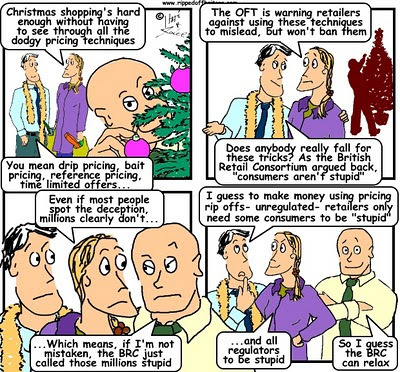 But while the law only protects the more than average half of Britons, the Office of Fair Trading provides detailed guidance so even the most brutishly stupid retailer will understand how to skirt around consumer protection law if he is so inclined. A kind of 'no retailer left behind' scam tutorial. To help the dimmer retailers OFT's guidance provides pictures to make sure retailers don't need a moral compass to navigate the law. The law identifies 31 practices that are banned under all circumstance. But apart from those 31, anything goes so long as it only hits the 'less than average'. In short, if only the less than average consumer – amounting to half the targeted customers – is tricked then that is fine. It is rather touching that the OFT can't bring itself to say the practice is "FAIR", only that it is "NOT UNFAIR" and therefore legal. So the eight supermarkets have simply said they will stop ignoring what the OFT has already been saying. What is truly revealing is not that the supermarkets pull off stunts to rip us off. Not much surprise there. What is truly revealing is these stunts, even when put under the regulatory microscope by the OFT, are found to be legal! As we have pointed out in previous posts, British law regards Britons as the lawful prey of businesses. The law regards us rather as a gamekeeper regards pheasant and grouse: we are worth protecting because we make such good eating. The law is happy for us to be ripped off so long as it is only the ‘less than average’ half of us that are the victims. It is the law of the jungle. However, the law of the jungle has a benefit. It makes species stronger by natural selection. Consumer law does not make anybody stronger. The law refusing to protect the 'less than average' simply unleashes rippers-off, licencing them to rip off the vulnerable. By allowing retailers to rip us off it gives a competitive advantage to them over retailers who are honest. Driving honest retailers out of business. Making the 'retailing species' more corrupt. To be fair to the OFT they just enforce the law created by Parliament. If the law says it is legal, then it is the law that is the problem. Not condoning but ... 'half' of all customers 'below average' only applies if 'average' refers to median - in commonest usage of 'average', most will be 'average'. Still shocking. Sadly you are correct, many people think 'average' means 'most'. But the law, and unscrupulous companies, would use a more accurate interpretation as a loophole to rip us off. For most normal things - like height, weight, and ability to understand contract terms - a population follows a 'normal distribution', sometimes called a 'bell curve'. For a 'normal distribution' half the people are below average. Regardless of whether it means mean or median (or modal value? ), what characteristic is it they are intending it to be the average of? It obviously doesn't mean height or weight, but possibly some characteristic such as intelligence or gullibility, perhaps? In which case we have a law that allows practices that make misleading claims because those above this average will see right through them, but it's OK to mislead the rest - the ones we do need to be protecting. Bizarre.